I’ve recently been accused of posting too many orange nail polish swatches—despite it being fall and Halloween season!—so today’s Throwback Thursday swatch is Madness (333), a deep chocolate brown cream that is perfectly vampy, yet avoids looking as harsh as black. 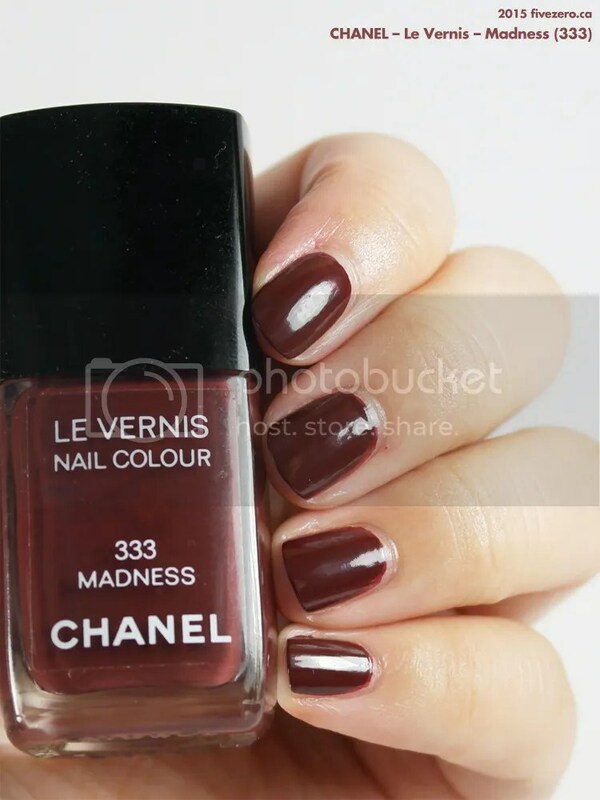 In the bottle, Madness looks like a dark reddish brown with a hint of raisin, and this is how it looks on the nail with one coat. With two coats, which you’ll need to get it nicely even and opaque, it transforms into a darker, vampier shade of deep brown. This really is one of my favorite deep brown creams. 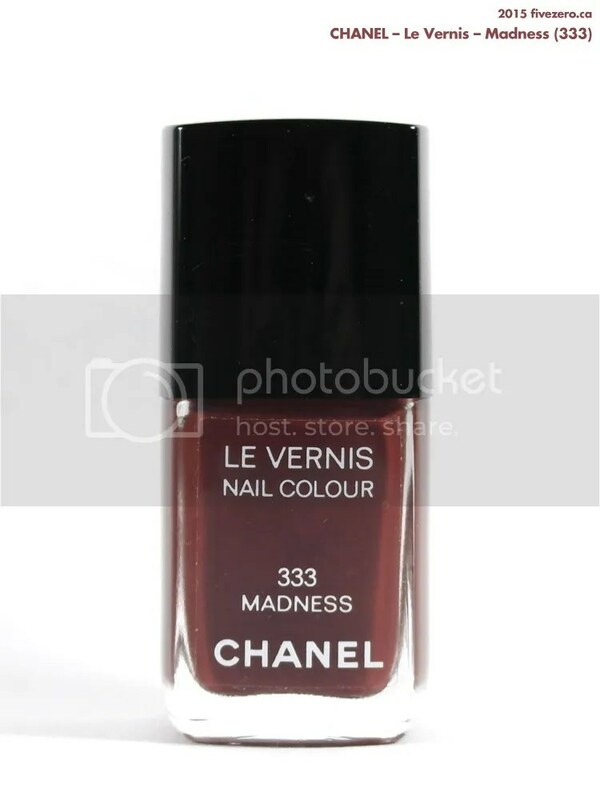 It’s a very rich shade of cocoa, and with two coats it doesn’t lean overly red. I find many deep browns go either too red, too purple, too grey, or just too black, and Madness strikes the perfect balance for a vampy brown. It is discontinued, but if you can find it, I’d heartily recommend it for vampy lovers! Chanel S.A. is a private company based in Paris, France. It was originally founded in 1909 by Gabrielle “Coco” Chanel; its current owners are descendants of one of her early business partners. Oh I do love that color! This polish is a good solid shade of brown – like you said, not too dark / red, that it doesn’t register as brown on the nails in normal lighting. Is the formula from 2007 better than they are these days? I keep reading about poor performance on Chanel polishes. You can make brown by combining the three primary colors, too, so I say neeeeah! 😀 The formula seems good but not great – kind of like the current formula, though it’s inconsistent, as well. I definitely don’t get them for their formula – just the colors. It’s kind of obnoxious that they can’t improve the formula at this price point, though. If it came out redder I would have liked it more!